A town with 50+ thousand people has just a couple of experienced rock-climbers, two climbing walls and an awesome area of natural sandstone. 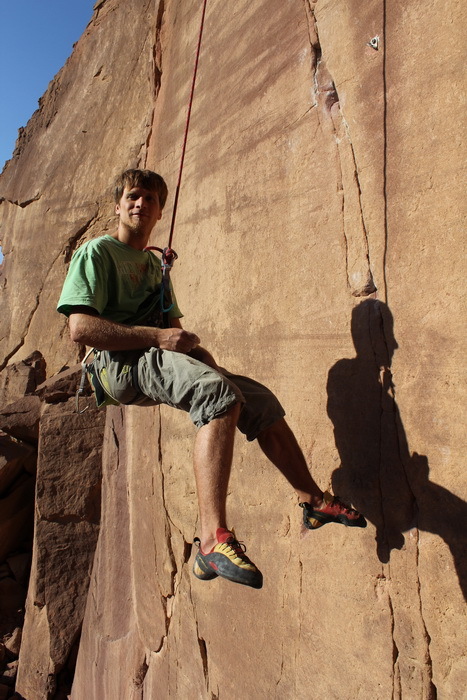 Due to the warm and tourist-friendly atmosphere of the town the local rock climbing community is very nice, peacefull but not constant and small. An overall image of a rock-climber in Eilat is a young diving instructor having settled there for a couple of months or years. He has had enough of it with his clients under water during the working day and is eager to stretch his legs in the evening. But none of them stay in Eilat for a considerable time period, so there is no constant group of regularly training climbers there. 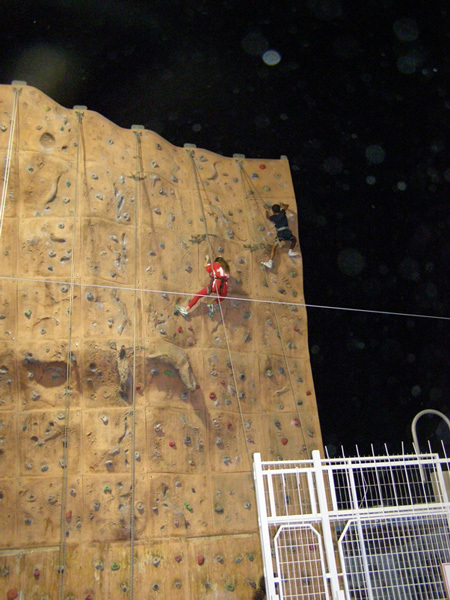 So I was one of those temporary rock-climbers of Eilat. On the one hand, I was not a beginner as compared to others. On the other hand, it was Eilat where I started my regular trainings afresh after the injury and came back to the physical shape I once had had. 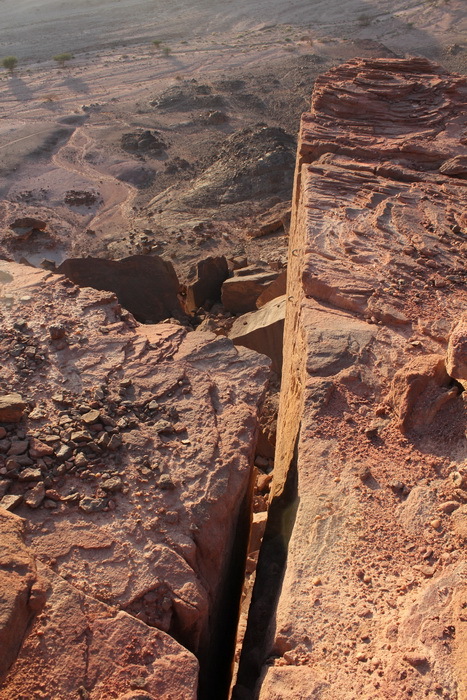 I will remember the old and rickety climbing wall “Matnas”, the modern extreme-park “Top94″ and the bizarre “Solomon’s Stables” made of sandstone in the national park of Timna for the rest of my life. The climbing wall “Matnas Kulier” was built about 20 years ago. It was built on the donations from Canada and were intended to develop the children’s center of sports and culture. 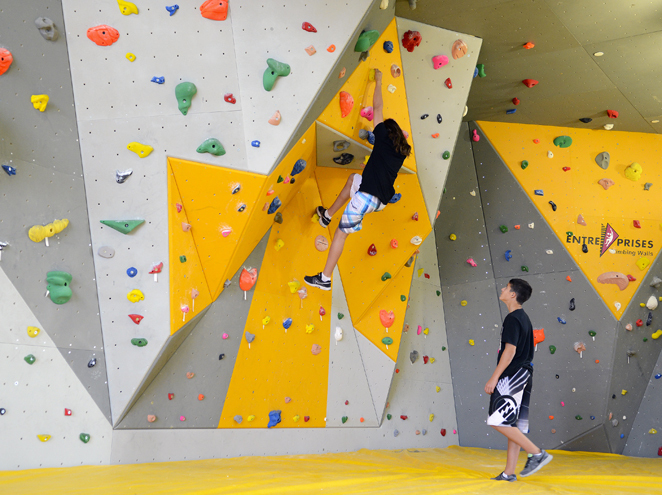 This is one of the cheapest climbing walls in the world – you have to pay only 4$ to go there. This price includes a pair of old and torn climbing shoes, harness, tea/coffee and an almost 100% guarantee that you’ll meet someone ready to help and talk to you there)) This climbing wall has only top-roping slightly-to-medium overhanging routes. The routes with holds themselves are boring, ugly and always the same. But the feature is just ideal! Thanks to it one can get endless pleasure of 6 rock-like tracks (6b+, 6c, 7a, 7a, 7b+ and 8a+) and their few combinations. This climbing complex was the place where I started to return to my previous physical shape and to revive my climbing skills after a 4-year break. 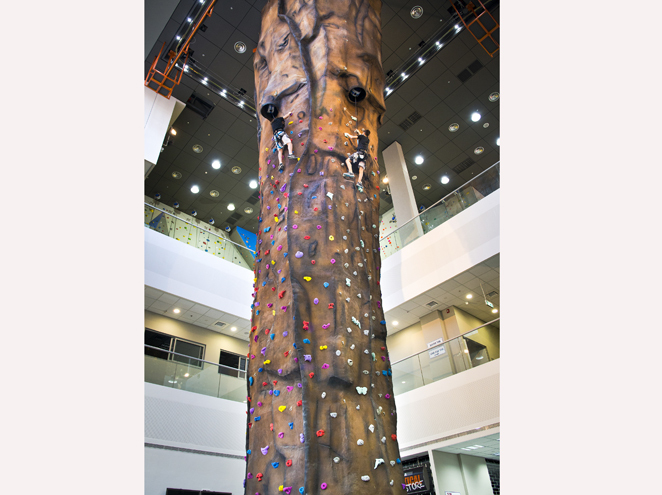 The only real local rock-climber (Yossi) worked there for several years and now is the manager of the new extreme entertainment complex TOP 94. I started to train on the climbing wall of this complex together with him. 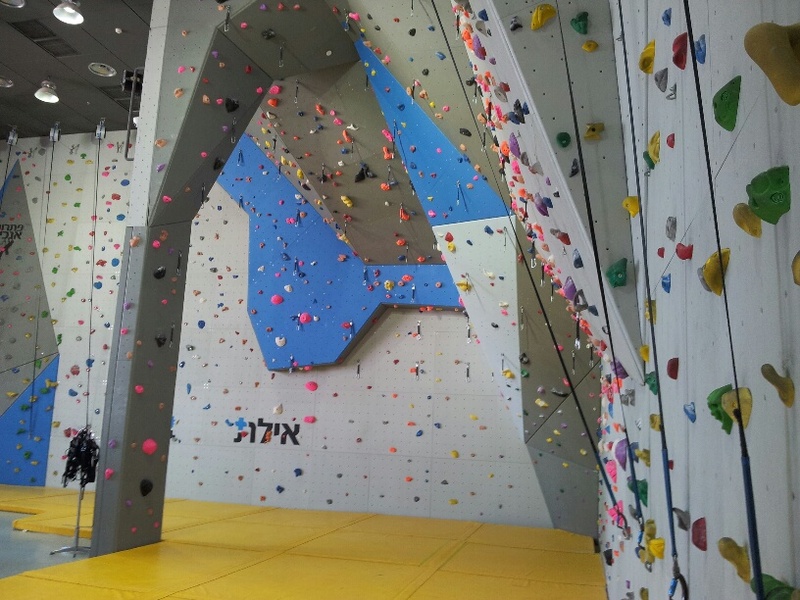 While the complex was being built Yossi insisted it should have a lead zone – and this climbing wall finally turned out to be a good training venue. At the heart of the complex there is a 19-meter-high climbing wall that is still waiting for the real routes to be set. The complex daily opens its doors to thousands of children who have fun at the rope adventure park, all sorts of slides, jumps and ladders. Seriously training rock-climbers are hardly ever seen there. There is a bouldering hall there. You could put more holds, there are plenty in the storage… I can’t do bouldering at all because I absolutely can’t put my left leg in danger of being hurt or fallen upon. 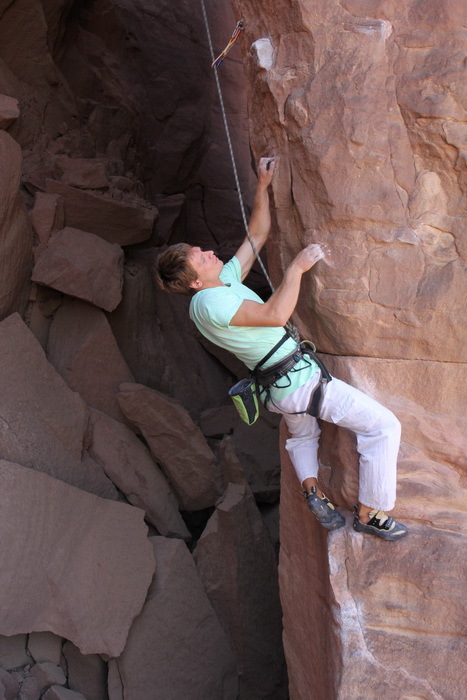 But the real pearl of rock-climbing in this Red sea region is the natural climbing area in the national park of Timna. There used to be the ancient Egyptian mines there and now you can enjoy a couple of dozens of climbing routes – from the easiest ones to those marked 8a+. it is a uniquely picturesque sandstone area where you can climb all year round. Rains hardly ever happen there. But if you go there in summer, you’ll be able to train only in the morning, because after 11 a.m. it is scorching hot there)) There are all types of feature: overhanging, vertical and sloping. You should try to visit his place by all means. Even those who do not climb will appreciate this place’s unusual beauty and diversity of sandstone colours and shapes. You have to pay to go there but you can stay there overnight, there are modern conveniences on the territory. There are also marked cycle and walking routes and even a canteen. And some great bouldering as well with perfectly flat sides. I can’t assess their quality – I didn’t try them myself, but they say there are some worthy ones. Guidebook to the area in Hebrew.